Nigerian sensation Kelechi Iheanacho has been named the winner of the CNN Goal of the Week Award beating three-time FIFA Ballon D’Or winner Cristiano Ronaldo to the coveted prize. The 20-year-old was on target for the Super Eagles when they defeated Zambia 2-1 in Ndola during the 2018 FIFA World Cup Qualifier. The Manchester City forward breezed past two Chipolopolo defenders to meet a return pass from strike partner Brown Ideye before rounding off the goalkeeper and calmly slotting the ball home despite the presence of two defenders on the line. Interestingly, the Nigerian was named winner of the CNN Goal of the week accolade on September 8 after his wonder strike helped the Super Eagles defeat the Taifa Stars of Tanzania in the final game of the 2017 African Nations Cup qualifiers. 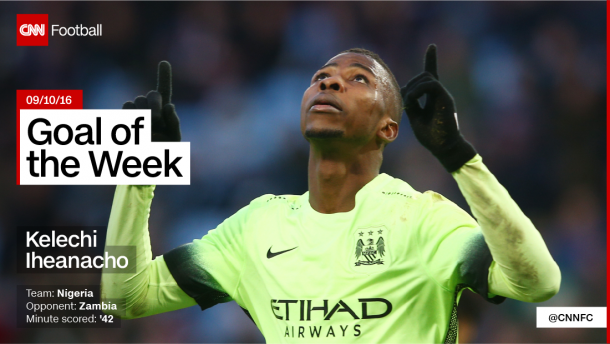 “Congratulations to the latest CNN Goal of the Week winner, @67Kelechi!,” CNNFootball wrote on their official twitter handle. Last season, Iheanacho boasted a goals-per-minute ratio that was the best in Europe’s top 5 leagues as he finished the season with 14 goals for Manchester City in his breakthrough campaign. Iheancho has scored twice already this season with three assists for the Citizens and earned an overwhelming 75% of the votes from an online CNN poll to beat Real Madrid’s Cristiano Ronaldo who could only pick 20% votes.